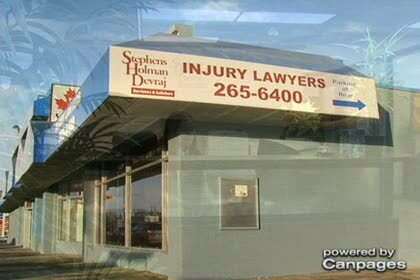 For over 20 years, Stephens Holman Devraj has helped protect Albertans who have been injured in accidents. Our personal injury lawyers can help you get the financial, medical and emotional support you need if you or a family member has suffered severe or fatal injuries. In addition to Calgary, services are available to Brooks, Lethbridge, Medicine Hat, High River, Red Deer, Okotoks, and all of Alberta. Situated at 412 16 Ave NE in Calgary, Stephens Holman Devraj is an enterprise within the lawyers section of Canpages.ca online directory. Dial 800-661-6400 to do business with Stephens Holman Devraj that is near your area.